The Aegis adjustable sensitivity AC Voltage Detector is the only tool you need to test AC voltage. The CZ20074 is one of the best Voltage Detectors on the market. 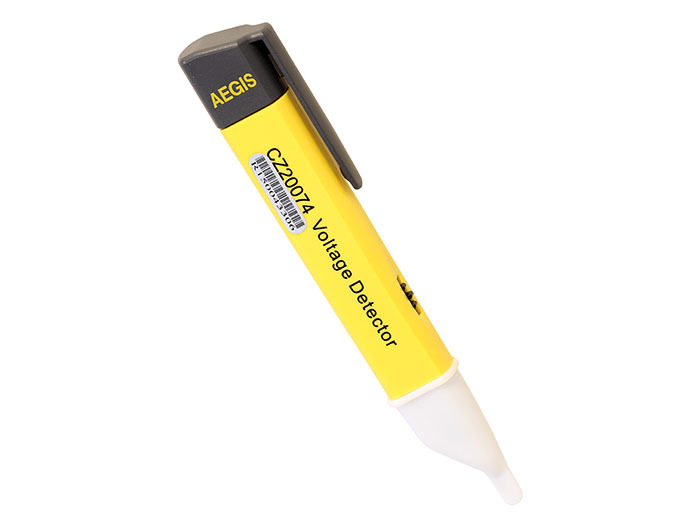 About the size of a marking pen, this battery operated, non-contact tester detects AC voltages from 50 - 1000V. It's easy to operate, with flashing LED indicators, an audible buzzer and vibration to alert the user when the AC voltage has been detected. The unit will glow green when safe, and when voltage is detected it will flash red and beep at an increasing rate as you get closer to the voltage source. The sensitivity is able to be adjusted using the rotating thumbwheel. Sold to electricians and contractors worldwide, the CZ20074 is a tried and tested, proven tool, perfect for testing all indoor AC voltage outputs. Note! Subject to technical change without notice.